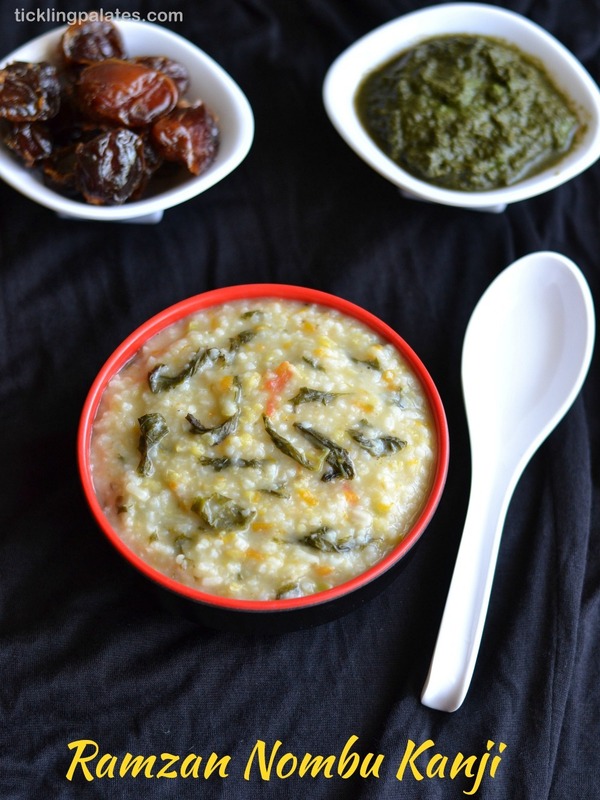 This Nombu Kanji or Gruel is the vegetarian version of the famous South Indian Ramzan Nombu Kanji Recipe that is made for Iftar and distributed in all Mosques across Tamilnadu during the holy month of Ramzan or Ramadan. Traditionally this porridge is made with either mutton or chicken and is supposed to be more flavorful and aromatic and takes a long time to cook for all the flavors to emerge and mingle. This vegetarian version is also nothing less in terms of flavor but it gets cooked in no time. This gruel is vegan, 100% fat free, gluten free and makes a wholesome meal in itself. In Trichy where I grew up, the Muslim friends also add drumstick stick leaves as its available in plenty in all the households and not only that it’s a rich source of iron. It helps in treating mouth and stomach ulcers which some may suffer especially as they are fasting for such long hours every day. You can do this in the pressure cooker but making it in the open vessel helps all the ingredients and the flavor to merge well. Other than carrots, you can also add mixed vegetables like beans, cabbage and peas. Adding mixed vegetables and drumstick leaves are optional. 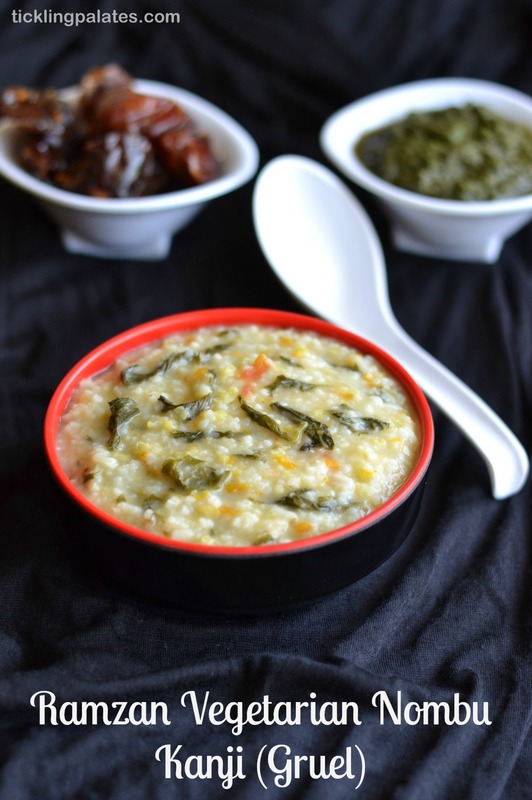 Use raw rice (Pachcharisi), especially the one used for making pongal to make this nombu kanji and not boiled rice (Puzhungal arisi). The new rice (Pudhu arisi) gets cooked fast and becomes mushy quickly. Do not cook after adding coconut milk else the gruel will curdle. Add it only after you switch off stove and heat of the gruel is enough for it to release its flavor. If you find the porridge or gruel becoming thick, a while after cooking, add hot water to dilute and to adjust the consistency. This nombu kanji is not only good to be made by the Muslims during Ramzan but it also makes a sumptuous, filling breakfast for physically hard working people and apt for all the people who keep fast (vrat). 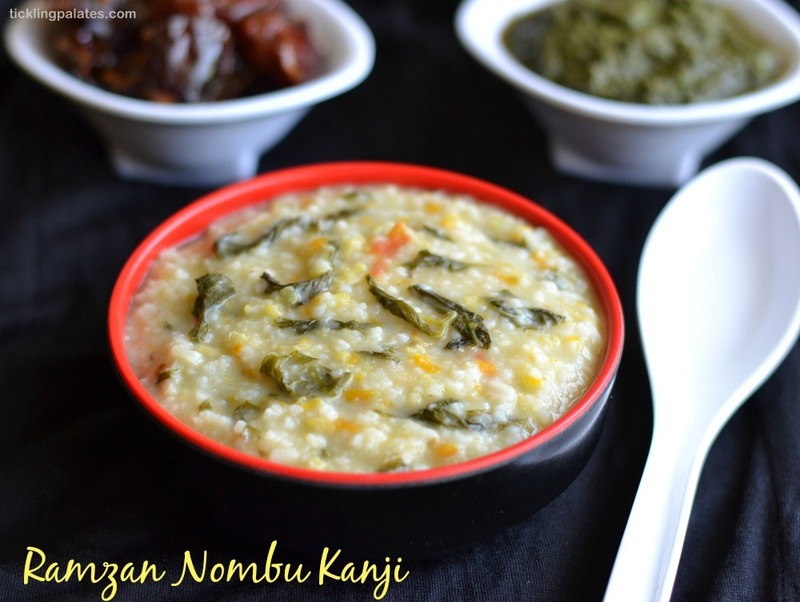 As this nombu kanji is a zero oil recipe and makes a filling and healthy breakfast or lunch for the weight watchers. 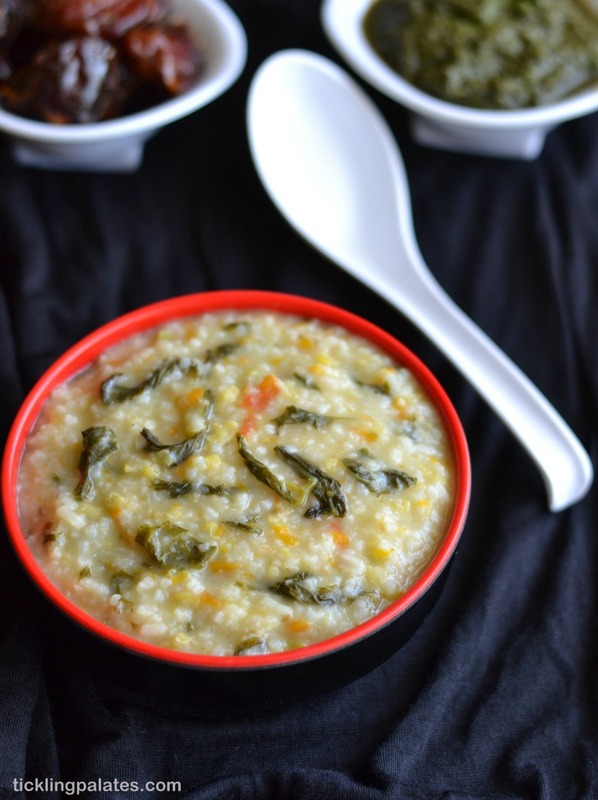 You can also replace rice with any variety of millet for a more healthier option in case you are a diabetic. For Iftar, the muslims serve it with either urad dal vadas or samosas along with pudina thogayal or chutney and dates. To distribute to the vegetarian neighbours they also make Palakottai Vadai, Phirni and Carrot Halwa. Vegetarian Nombu Kanji that's cooked and served during the the Month of Ramzan for Iftar. Chop the tomatoes, garlic, green chili, mint leaves finely. Grate the ginger and carrot. With a mortar and pestle crush the fennel seeds coarsely and keep aside. Wash rice and moong dal well. In a wide, thick bottomed, deep pan, bring the water to a boil. When you see the bubbles appearing, add washed rice, moong dal, chopped tomato, garlic, chili, mint leaves, grated carrots, ginger, drumstick leaves, cinnamon stick, crushed fennel seeds and mix well. Close the pan partly with a lid and cook for 10 mins over medium-low flame, stirring in between. Add salt, mix well and cook over low flame till the rice is cooked to a soft, mash able consistency. Mix in between. Switch off flame. Immediately add coconut milk, mix well and close the pan tightly with a lid for the flavors to merge well. Ramzan Nombu Kanji is ready. 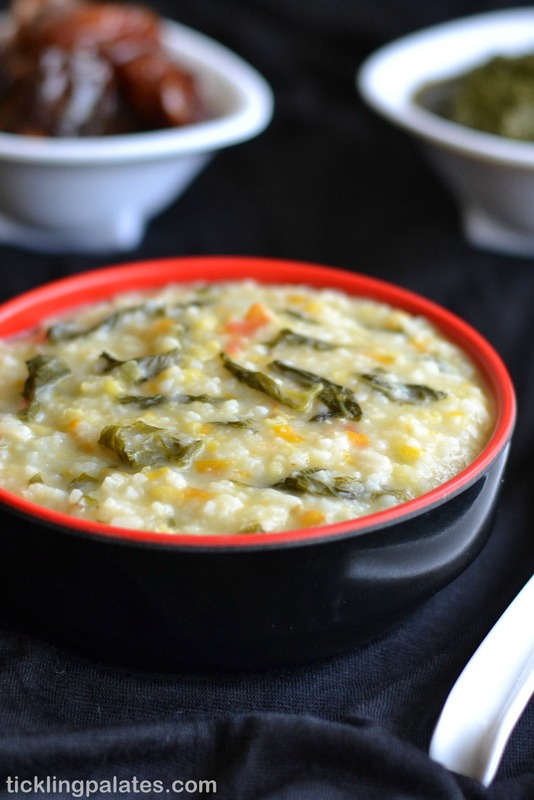 Serve piping hot with pudina thogayal. kanji looks good though i know noone will have it at my place i will try it for me. My moms cooks this every time.. She had cooked this yesterday but I dint get the chance to eat.. I have wait another year to eat this.. I love Indian food and am always so intimidated to try and make it myself, but I might give this one a shot 🙂 Looks great! Love this dish. My all time favorite food made by mom. Welcome Mohammed and Ramadan Kareem to you and your family as well. Thank you so much. This happens to be one of my favorite. Simple, filling and nutritious.